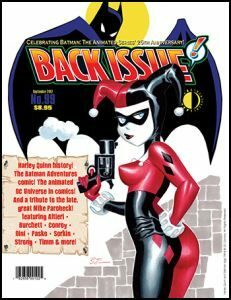 You are here: Home » MEDIA » Comics » Back Issue #99 September 2017 (magazine review). Back Issue #99 September 2017 (magazine review). You can never get past the fact that time flies and how quickly it passes. With this ‘Back Issue’, we look back 25 years to the ‘Batman: The Animated Series’ as well as the comicbook series that used it as its source material. It also brought the likes of Bruce Timm and Paul Dini in to do work on it. John Trumbull does an incredible job of lining up the animated series production staff and voice artists that it sounds like he had them all in the same room and went from one to the other for information. Although I never saw the series when it was out, these interviews have at least made me intrigued by the series. There’s also a model sheets for the main characters and an episode guide as well. A point to note is that the series also introduced Harley Quinn to the Batman mythos and made her pal around with Poison Ivy. Only one of the voice artists, the late Bob Hastings, is given his own couple pages and he did the voice of Commissioner Gordon. His career is examined, including two appearances in the 1966 ‘Batman’ TV series. There is also a look at the animation series Batmobile and other toys. I’m still wondering if we’ll ever have a look for the Batmobile that will stick or will it be forever be redesigned. Then again, would the Batman have an electrically driven car? The look at the ‘Batman: Adventures’ comicbook had a smaller but interesting life. Here, I do recognise something as I reviewed ‘Mad Love’ starring Harley Quinn and Poison Ivy a couple years back. This series did win three Eisner Award trophies even if it wasn’t a sales leader. From there, we look at the ‘Superman Adventures’ comicbook based off the animated series. An interesting comment from artist Neil Vokes is that it was harder to keep a simple style than the traditional detailed approach. I was less aware of the ‘Adventures In The DC Universe’ and I suspect if you’re after anything carrying any of your favourite characters, issues are still out there. The key artist on the ‘Batman Adventures’ was Mike Parobeck and having read about him up to this point, I was shocked that he died as a result of Type One diabetes complications. As one myself, such a diagnosis is rather broad but checking elsewhere it looks like he wasn’t balancing his diet and insulin which is never a good thing. Of course, this ‘Back Issue’ couldn’t finish without a look at Harley Quinn herself. Apart from an interview with creator Paul Dini, there are loads of photos and a look at the various voice artists who’ve contributed to her character and her usage in the comicbooks. I can understand what they are cautious with using her with her beau, the Joker, but it did make me wonder why other members of the Batman’s rogue galleries never have female alternatives. I learnt a lot from this issue on a subject I hadn’t really explored before and now finding myself thinking over looking at the animation series itself. The lady with the mallet behind me didn’t not force me to say that. Back Issue # 68 (magazine review). Back Issue #102 February 2018 (magazine review). Back Issue # 92 October 2016 (magazine review). « The Magazine Of Fantasy & Science Fiction, Jul/Aug 2017, Volume 132 #732 (magazine review).